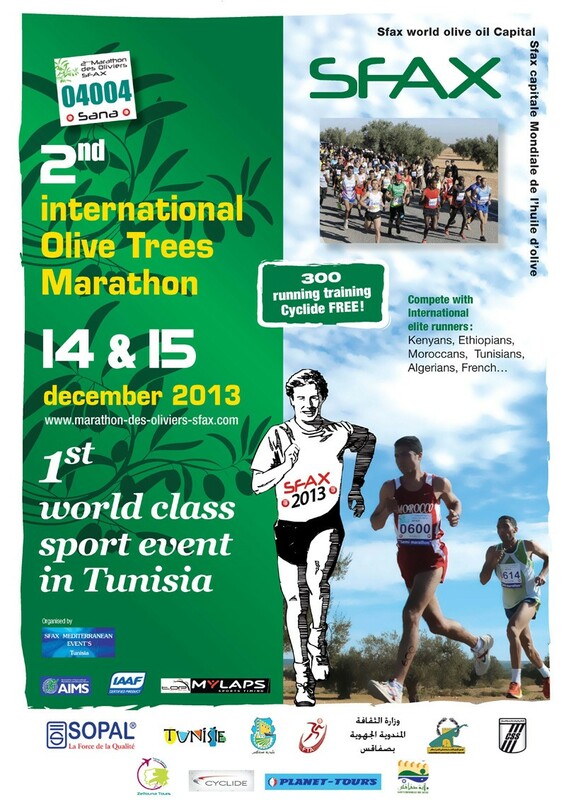 The second edition of the International Olive Trees Marathon/Marathon International des Oliviers de Sfax will hold in Sfax City, Tunisia from Saturday 14 - Sunday 15 December, 2013. On Sunday, December 15, 2013, this exceptional marathon will see a number of participants running in the heart of a historical place and one of the most beautiful areas of olive fields in the region of Sfax. The 42.195 Km marathon are composed of 2 laps in the heart of one of the most beautiful sites in Tunisia; 600 hectares of olive trees. According to the editorial director of the LOC, Mr Naamen Bouhamed: "The idea came from a simple and nevertheless ambitious project, to revive the city and the area of Sfax- the Mediterranean capital, thanks to its cultural Arabo-Andalous architectural heritage and its maritime history. "Sfax is an open door for the internal areas of Tunisia; Since the 11th century, the port of Sfax has always been an excellent stop for the Mediterranean exchanges. "Why “Olive trees” marathon? What is more beautiful than running surrounded by those emblematic trees? The aim of this race is to bring together history of the men, to bring back to life and rediscover again this heritage which is still alive today. A city, a region, a capital, a Mediterranean metropolis which aspires to play its role in the future of the new Tunisia.